In 2014 facing ongoing water contamination issues, Plant Bowen Water Research Center, opted for a full-scale trial of Hydro-Optic Disinfection (HOD) UV technology to help find a viable solution. Traditionally, coal-fired steam generation power applications use reverse osmosis (RO) technology to provide high purity feed water for the boiler and steam cycle. Free chlorine generating solutions are commonly injected into the feed lines of the water treatment process, as it is an oxidizer in aqueous solutions. This is used to reduce the microbial load. RO membrane elements are easily damaged by such strong oxidants; therefore, membrane performance warranty terms usually include specifications allowing the level of free chlorine to not exceed a concentration of 0.1 ppm in feed water to the membrane unit. The typical water treatment facility aims to produce water with undetectable levels of free chlorine. RO membrane elements need to be protected from oxidation and biological fouling to minimize frequent membrane and micron-filter maintenance and replacement. Therefore, a de-chlorination process is undertaken to remove the free chlorine compounds from the feed water in order for the equipment to operate properly. Without proper de-chlorination, the impacts of biofouling on RO technology would raise the amount of times the membrane element would need to be replaced along with associated costs, increase cleaning in place, production loss, energy cost increases, and product quality being compromised. De-chlorination can be achieved through chemical and non-chemical treatment processes. A typical non-chemical approach is to pass feed water through activated carbon filters; however, this is not a common practice used in power plant applications. Though, a common practice in power plants is chemical neutralization through the injection of sodium bisulfite (SBS) or sodium metabisulfite (SMBS) solution into the feed water. The difficulty of SBS/SMBS neutralization is that it is a chemically based approach attempting to balance the chemical feed with the ever-changing chlorine demand. Thus, this approach requires additional handling, storage and operational requirements. As an alternative to conventional methods, ultraviolet (UV) treatment can be used as a chemical-free de-chlorination approach in boiler feed water applications. Plant Bowen faced frequent membrane and micron-filter maintenance and replacements despite their use of a SMBS de-chlorination process. As a result, they decided to evaluate a treatment alternative that would enable them to replace the use of SMBS, reduce their use of free chlorine, and achieve a chemical-free de-chlorination process. The chemical-free process uses hydro-optic disinfection (HOD) UV technology and is designed to replace traditional disinfection methods such as the use of chlorine, ozone and pasteurization. It’s a small solution and a safe alternative to chemical methods, avoiding storing chemicals, and leads to free chlorine FAC and chloramines to undetectable levels. UV is a physical process for disinfection that exposes bacteria, viruses and protozoa to germicidal wavelengths of UV light, measured as nanometers (nm), to render them incapable of reproducing or further infecting a water system. Through UV oxidation, UV light can also destroy chemical contaminants. The Hydro-Optic UV technology uses a proprietary MP (medium pressure) UV lamp and effectively “recycles” a required UV dose throughout the reaction chamber using a patented internal reflection technology similar to fiber optic science. The core of the HOD technology is its water disinfection chamber made of high-quality quartz surrounded by an air block instead of traditional stainless steel. This configuration uses fiber optic principles to trap the UV light photons and recycle their light energy. The photons repeatedly bounce through the quartz surface back into the chamber, effectively lengthening their paths and their opportunities to inactivate microbes. Ensuring the proper precision lens is designed and crafted for your equipment to reach its full potential is where Universe Optics comes in. The requirements for the corresponding optical equipment with respect to sensitivity and accuracy is very high. We are committed to manufacturing your lens to meet the standards you require. 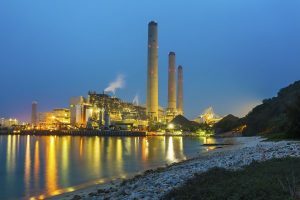 Power plant applications looking to replace the use of SMS/SMBS and achieve a chemical-free de-chlorination process may benefit from HOD UV Technology. The efficacy of the HOD UV technology, coupled with its specific operating principles and ease of use, allows for a unique chemical-free approach to dechlorinate and disinfect boiler feed water. Using hydro-optic disinfection to disinfect process and product water is also claimed to result in healthier, tastier food – free of chemicals and disinfection by-products – and can in turn, extend food shelf life.